Congratulations! Your little bundle of joy is on the way and life is about to change in a myriad of ways. Studies show that new parents lose an average of 200 hours of sleep the first year of their baby’s life. That’s five weeks less of shut-eye and means it is time to streamline your lifestyle so that you can live simply while maintaining your health, standard of living and sanity. 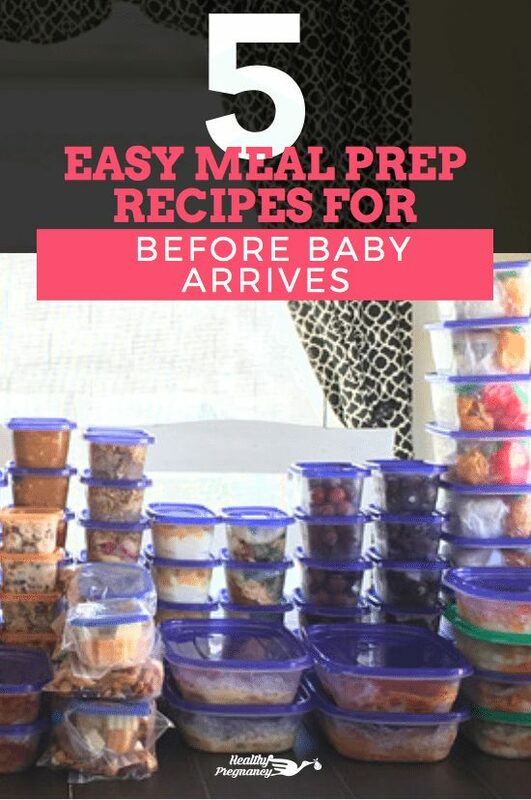 Setting up for easy meal prep before your baby arrives is a great way to ease your family’s growing pains and relish this time with your little one. You are likely already purchasing baby supplies; while you are at it, consider adding a crock pot to your list if you don’t have one already. Simple kitchen items such as freezer bags of gallon and quart sizes, a permanent marker or Sharpie, foil and cling wrap should be well-stocked while setting up for easy meal prep. Be prepared, too, with well-organized and matching storage containers for freezing and leftovers. Many grocery stores now offer grocery pick up or delivery. You need only an internet connection and a little foresight and you can have fresh ingredients delivered to your door, or be able to pick-up your selected, bagged groceries within a matter of hours. Research the options available in your area so that you have a plan for those times you may be homebound with a newborn or have minimal time to get shopping done. Here are a few headache-free meal options you can prepare with a newborn in the house, or prepare them ahead of time, in your last couple weeks at home before your little bundle of joy arrives. Simply cook these dishes up and enjoy them right away or freeze them into separate containers. When you’re ready for a meal, take them out to defrost the morning of or the day before and prepare them a variety of ways. Directions: Add chicken breast to the bottom of the crock pot and empty the entire jar of salsa on top of the chicken. Cook on HIGH for four hours, no stirring needed. After the chicken is fork tender, use two forks to shred the chicken and stir the chicken and salsa combination. When ready to use, add the chicken to a tortilla and top with cheddar for a quick quesadilla. Add taco ingredients and chicken to a bed of lettuce for lighter fare. Or for a different take that tastes delicious, spread the chicken out on a bed of rice. Directions: Add pork loin to crock pot, cover with root beer and cook on HIGH for four hours. Barbecue is ready when pork can be shredded with two forks. Add shredded pork to small rolls for BBQ sliders. Included a can of baked beans and mashed potatoes or coleslaw for a southern-inspired BBQ meal. Top off a baked potato or sweet potato with shredded pork and additional toppings for a loaded BBQ potato option. Directions: Add all items except cream cheese to your crock pot and combine. Cook on HIGH for two hours, no stirring required. After the second hour, add the package of cream cheese and continue cooking for an additional hour. When the potato chunks are fork softened, the soup is ready. Consider adding bacon bits or sour cream garnishes for loaded baked potato soup. Directions: Preheat oven to 350 degrees F. Spray 12 muffin cups with cooking spray. Sauté veggies in olive oil until softened. Whisk eggs, milk, salt and pepper together in a bowl. Add cooked vegetables and cheddar cheese into egg mixture. Use a 1/4 cup to scoop mixture into each muffin cup. Bake in the preheated oven until frittatas are set in the middle and lightly browned, about 20 minutes. Cool enough to remove and make a second batch, one for enjoying now and one for freezing. Directions: Whisk together all ingredients in a medium-sized mixing bowl. Spoon into a storage container with a tight-fitting lid. Close and refrigerate overnight before eating. A new addition to the family means an abundance of joy, but also can be overwhelming and takes some adjustment. By setting yourself up now for easy meal prep later, you will find that your waking hours can be spent gazing at your little one, not staring blankly at the open refrigerator.